"The Salad Bowl of the World"
"Rich in Land, Rich in Values." In 1848 California officially became a part of the United States of America. This transition followed several years of battles in the Salinas area with John Fremont flying the American flag on the highest peak of the Gabilan Mountains and claiming California for the United States. Before the transition to American administration, Monterey had been the capital of California. For a short while after the transition, California was ruled by martial law. 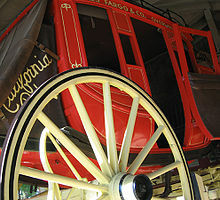 On September 9, 1850, California was admitted to the Union and became a State, celebrated as California Admission Day. In the 1850s a junction of two main stage coach routes was located 18 miles east of Monterey and along the big bend of what is locally referred to as the Alisal Slough. In 1854, six years after becoming a part of the United States, a group of American settlers living in the vicinity of this route-junction opened a post office at the junction, naming their town "Salinas," apparently a reference to the original "Rancho Las Salinas" name for the area, which in turn was named in Spanish for the salt marshes of the area around the central Salinas slough, which was drained. 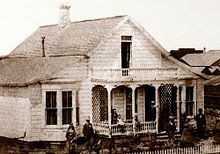 Soon thereafter, in 1856, a traveler's inn called the Halfway House was opened at that junction in Salinas. (The nearby Salinas River, was apparently only later named by an American cartographer, after the nearest town of Salinas in 1858. Previously that river had gone by the name: "Rio de Monterey."). The streets of Salinas were laid out in 1867, and the town was incorporated in 1874. The conversion of grazing land to crops and the coming of the rail road in 1868 to transport goods and people was a major turning point in the history and economic advancement of Salinas. Dry farming of wheat, barley, and other grains as well as potatoes and mustard seed was common in the 1800s. Chinese labor drained thousands of acres of swampland to become productive farmland, and as much early farm labor was done by Chinese immigrants, Salinas boasted the second largest Chinatown in the state, slightly smaller than San Francisco. Irrigation changed farming in Salinas to mainly row crops of root vegetables, grapes and sugar beets. Many major vegetable producers placed their headquarters in Salinas. The historic prevalence of row crops is documented by aerial photographic interpretation of Earth Metrics, Driven by the profitable agricultural industry, Salinas had the highest per capita income of any city in the United States in 1924. 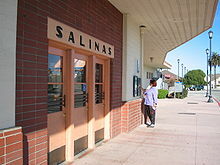 Wikimedia Commons has media related to Salinas Assembly Center. During World War II, the Salinas Rodeo Grounds was one of the locations used as a temporary detention camp for citizens and immigrant residents of Japanese ancestry, before they were relocated to more permanent and remote facilities. 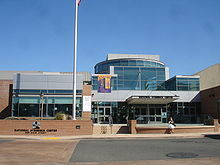 One of seventeen such sites overseen by the Wartime Civilian Control Administration, the Salinas Assembly Center was built after President Roosevelt issued Executive Order 9066, authorizing the removal and confinement of Japanese Americans living on the West Coast. 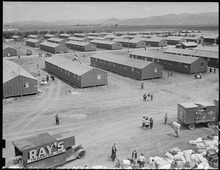 The camp opened on April 27, 1942 and held a total of 3,608 people before closing two months later on July 4. Following World War II major urban and suburban development converted much farmland to city. The city experienced two particularly strong growth spurts in the 1950s and 1960s, and again in the 1990s and early 2000s. Aerial photographic interpretation indicate such major conversion of cropland to urban uses over the time period 1956 to 1968, while the city annexed the adjacent communities of Alisal and Santa Rita during this time. The Harden Ranch, Creekbridge and Williams Ranch neighborhoods constituting much of the city's North-East were built almost exclusively between 1990 and 2004. Salinas was also the birthplace of writer and Nobel Prize laureate John Steinbeck. The historic downtown, known as Oldtown Salinas, features much fine Victorian architecture, and is home to the National Steinbeck Center, the Steinbeck House and the John Steinbeck Library. Traditionally an Anglophonic European American settlement, Salinas became home to a significant Asian minority who joined European-American immigrants in the agriculture and fishing industries at the turn of the 20th century. Meanwhile, the neighboring and, at the time, unincorporated community of Alisal became a mecca for Hispanic immigrants primarily from Mexico, drawn to opportunities in the area's agricultural industry. 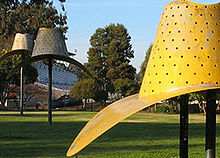 When annexed in 1963, Alisal was described as a large Mexican-American enclave, added to a city that was still otherwise majority European-American. Hispanic immigration peaked from the 1980s through the early 2000s. Mostly European-American neighborhoods in North Salinas, an expansion of the original city built mostly in the 1950s and 60s, became majority Latino by 2010. As Latino immigrants and their descendants became more affluent and established, the proportion of Hispanics increased in the city's more affluent South and North-East. From the time it was first built in the late 1980s, to the 2000 Census, Creekbridge – the city's highest income area, least affected by poverty - remained mostly European-American and minority Latino. By 2010, however, US-born Latinos had become the largest ancestry group in the area. In South Salinas, the city's original area and most European-American section, Hispanics typically constitute over 40% of residents. Despite its key role in the city's early development and significant Filipino immigration over recent decades, the Asian-American community of Salinas remains small compared to that of California on average. The highest concentration of Asian-Americans is found in Creekbridge, where they constitute roughly 1 in 5 residents. Along with the great influx of legal immigrants was an influx of undocumented immigrants. By 2011, Salinas had one of the highest concentrations of unauthorized immigrants in the state and nationwide. Of the city's three main zip codes, two had 10%-15% of residents being unauthorized immigrants, and a third over 15%. The fear many undocumented immigrants have of government authorities has been a great obstacle faced by local law enforcement in crime investigations, community relations, and gathering information needed for effective policing. As a result, Salinas police department policy is to not verify immigration status of individuals coming into contact with city police officers. 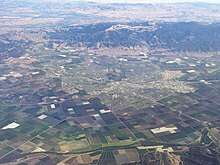 Salinas and the Salinas Valley. Fremont Peak and the Gabilan Range are also shown. Prior to mass agricultural and urban development, much of the city consisted of rolling hills bisected by wooded creeks and interspersed with marsh land. Today, the city is located mostly on leveled ground, with some rolling hills and wooded gulches with creeks remaining in the north-eastern Creekbridge and Williams Ranch neighborhoods, as well as the Laurel Heights section of East Salinas. The natural ecosystems accompanying the area's topography and environment have been recreated in Natividad Creek Park and adjacent Upper Carr Lake. The city rests about 18 meters (59 feet) above sea level, and it is located roughly eight miles from the Pacific Ocean. The Gabilan and Santa Lucia mountain ranges border the Salinas Valley to the east and to the west, respectively. Both mountain ranges and the Salinas Valley run approximately 90 miles (145 km) south-east from Salinas towards King City. On March 10, 2006, a record-breaking storm covered many of the nearby mountaintops in a white blanket of snow. Snow in the city of Salinas is extremely rare. Salinas has cool and moderate temperatures, due to the “natural air conditioner” that conveys ocean air and fog from the Monterey Bay to Salinas, while towns to the north and south of Salinas experience hotter summers, as mountains block the ocean air. 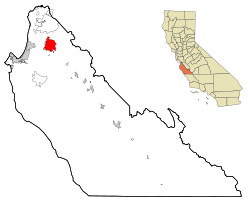 Thus, Salinas weather is closer to that of the Central Coast of California, rather than that of inland valleys, and thus has a mild Mediterranean climate with typical daily highs ranging from around 63 °F (17 °C) in the winter to around 75 °F (24 °C) in the summer. According to the Weather Channel, monthly average temperature highs range from 61 to 75 °F or 16.1 to 23.9 °C. The record highest temperature was 106 °F (41 °C) on September 14, 1971. The record lowest temperature was 18 °F (−8 °C) on December 21, 1937. Annually, there are an average of 5.5 days with 90 °F (32 °C)+ highs, and an average of 11.7 days with lows reaching the freezing mark or lower. Salinas is in the top ten American cities for cleanest air quality, because the offshore marine layer generates winds that blow smog further inland. Downtown Salinas in December 2018. Winter months are mild in Salinas and weather averages in the low 60's Fahrenheit during the day to the low 40's or upper 30's at night. The average annual rainfall for the city is approximately 13.26 inches or 336.8 millimetres. The wettest “rain year” since records at the present station began in 1959 was from July 1997 to June 1998 with 34.63 inches (879.6 mm) of precipitation, and the driest from July 1971 to June 1972 with 7.29 inches (185.2 mm). The most precipitation in one month was 11.10 inches (282 mm) in February 1998. The record maximum 24-hour precipitation was 2.96 inches (75 mm) on January 23, 2000. Occasionally, there is snowfall on the peaks of the Gabilan and Santa Lucia mountain ranges, but snow in the city itself is extremely rare, occurring about once every 5 to 15 years on average. An inch of snow fell in Salinas on February 26, 2011. As of the 2011–2015 American Community Survey by the U.S. Census Bureau, Salinas had a median household income of $49,840, slightly lower than the United States median of $53,889. The city was less educated than California and the nation as a whole, with the notable exception of sizable neighborhoods in the southern and northeastern portions of the city (see thematic maps and table below). The most affluent and educated neighborhoods in Salinas are Creekbrige (North-East), Laurelwood (Central-West) and South Salinas (South-West). 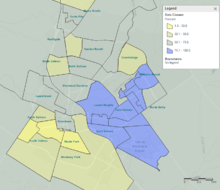 Hebbron Heights and East Salinas, also known as the Alisal, had lower educational attainment and household income when compared with other parts of the city - as it has been since the Alisal area containing it was annexed by the city in 1963. While most neighborhoods saw 1 in every 4-to-6 residents live in poverty, only 1 in 25 residents lived in poverty in Creekbridge – by far the lowest rate in the city and less than a third of state and national average. Regarding educational attainment, the pattern was different. There remained a significant disparity across the city, but the city's most affluent neighborhoods failed to exceed national or statewide averages despite having significantly higher incomes and lower poverty than California or the nation as a whole. Median Household Income by Census Block Group as of 2014[update]; the darker, the more affluent. Percent of individuals falling below US Federal Poverty Line; the deeper the red, the higher the poverty rate. Share of households with annual incomes of $150,000 or higher across census tracts in Salinas. Note: Census tract 9800 omitted from the table above. Although located within city limits, census tract 9800 consists solely of an airport, golf course and commercial area with a population of 0. The population was spread out with 47,180 people (31.4%) under the age of 18, 18,049 people (12.0%) aged 18 to 24, 44,978 people (29.9%) aged 25 to 44, 28,976 people (19.3%) aged 45 to 64, and 11,258 people (7.5%) who were 65 years of age or older. The median age was 28.8 years. For every 100 females, there were 102.1 males. For every 100 females age 18 and over, there were 100.8 males. Age distribution was 33.0% under the age of 19 or younger, 11.8% from 18 to 24, 33.7% from 25 to 44, 15.5% from 45 to 64, and 7.1% who were 65 years of age or older. The median age was 28 years. For every 100 females, there were 117.7 males. For every 102 females age 18 and over, there were 117.4 males. Salinas has long had a well-recognized, significant problem with organized street gangs, such as Nortenos and Surenos, and associated violent crime. According to the U.S. Bureau of Justice Statistics, the city's overall violent crime and homicide rates are above those for California and the nation overall. However, the violent crime rate in Salinas has declined by almost 24 percent since 2000. Gang activity and violent crime are focused in the poorer parts of Central and East Salinas and exacerbated by the city's comparatively low tax base and consequently limited policing resources. A hypothesis to explain the city's particularly intense problem with gang related violent crime cites the city's proximity to Salinas Valley State Prison. The prison was an early launch pad for street operations of the notorious prison gang, Nuestra Familia. This in turn, is seen as having spawned a legacy of multi-generational gang membership among the poorer and less educated residents of East Salinas. The headquarters of Taylor Farms in Downtown Salinas, was constructed in 2015. Major employers in Salinas include Taylor Farms, Tanimura & Antle, Salinas Valley Memorial Hospital, Natividad Medical Center, Mann Packing, Hilltown Packing, Newstar Fresh Foods, Matsui Nursery and Monterey County. Salinas is known for its AgTech industry, and is known as the emerging AgTech Capital of the nation and a global hub for agricultural technology. Its close proximity to Silicon Valley and large number of agricultural employers give forth to an ideal location for developing high tech agricultural innovations. Since 2015, Forbes has hosted the yearly Forbes AgTech Summit in Salinas. The event draws agricultural technology entrepreneurs from around the world and includes speakers, group discussions, tours, on site demonstrations. Salinas has an emerging arts scene led by the First Fridays Art Walk and the innovative use of non-traditional or business venues to exhibit art and host live local music. The oldest gallery in Salinas, the Valley Art Gallery, has been active for over 30 years. The Hartnell College Gallery hosts world-class exhibitions of art during the school year. The National Steinbeck Center has two galleries with changing exhibits, and the city's newest @Risk Gallery features humdrum exhibitions. The Art Walk, held in the downtown area, features 50 venues. 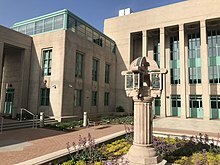 The city contains several art deco buildings, including the Monterey County Courthouse and the Salinas Californian Building. El Grito is a free annual event held every September in the Alisal Neighborhood of Salinas. The event draws up to 50,000 people and features a parade, performances, 120 vendors, authentic Mexican cuisine, and cultural exhibits. El Grito is a celebration of the beginning of the Mexican war for Independence from Spain. Salinas Founders Day is an annual event held since 1869, that celebrates the history of Salinas. The 2017 event was held at the Salinas Train Station Plaza in downtown Salinas, and included tours of the First Mayor's House and the Monterey and Salinas Valley Railroad Museum, music, and historical talks. Ciclovía Salinas is an annual event that has taken place in the Alisal neighborhood of Salinas since 2013, and features a 1.5 mile stretch of Alisal Street that is closed off to automobiles, and exclusively for use of pedestrians, bicyclists, and other non-motorized forms of transportation. The goal of the event is to promote youth leadership, walking, biking, and other recreational activities that promote a healthy lifestyle. The event is led entirely by Salinas youth volunteers and in 2018, it featured a 3-kilometer run, Cross Fit activities, soccer, zumba, boxing, community created murals, disc golf, folklorico dancing, and Oaxacan cultural dancing. As the host of a PRCA-sanctioned rodeo, Salinas is a major stop on the professional rodeo circuit. The California Rodeo Salinas began in 1911 as a Wild West Show on the site of the old race track ground, now the Salinas Sports Complex. Every third week of July is Big Week, when cowboys and fans come for the traditional rodeo competitions, including bull riding. Rodeo-related events held in Salinas and Monterey include cowboy poetry, wine tasting, a carnival, barbecues and a gala cowboy ball. The Kiddie Kapers Parade began in 1930 and is an annual parade with only children in costume, held in conjunction with "Big Week" and the annual Rodeo. The Salinas Asian Festival is a free annual event in Salinas held since 2009 that celebrates the culture and history of Chinese, Filipino, and Japanese immigrants in Salinas. The Salinas Buddhist Temple, the Salinas Chinese Association, and the Filipino Cultural Center of Salinas are open to tour. The event includes food, demonstrations of tai chi, Filipino folk dancing, kendo, and a bonsai display. The 2017 festival the Salinas Chinatown Virtual Walking Tour. 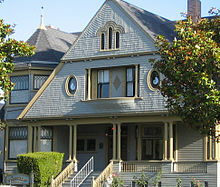 The John Steinbeck House was the birthplace and childhood home of author John Steinbeck, and is now home to a restaurant. The house was built in 1897 and is a Queen Anne style Victorian. Santa Lucia Highlands AVA is nearby so the area is becoming a destination for wine tasting. Hartnell College, as well as a satellite campus of California State University, Monterey Bay, are located in Salinas. Local newspapers include The Salinas Californian, Monterey County Weekly and Monterey County Herald. Television service for the community comes from the Monterey-Salinas-Santa Cruz designated market area (DMA). KSMS-TV Channel 67, KION-TV Channel 46 and KSBW Channel 8 provide news for the area as the area's Univision, CBS, NBC and ABC affiliates. Amtrak, the national passenger rail system, serves Salinas. Its Coast Starlight train runs daily in each direction between Seattle, Washington, and Los Angeles, stopping in Salinas. Greyhound operates from the Salinas Amtrak station with service to other California cities and throughout the United States. Salinas and its surrounding towns are served by Salinas Valley Memorial Hospital and Natividad Medical Center, both located in Salinas. Natividad is one of the University of California, San Francisco's teaching hospitals and is owned and operated by Monterey County. Salinas Valley Memorial Hospital and Healthcare System is a public district hospital run by an elected board of directors. Natividad Medical Center, through its affiliated Natividad Medical Foundation, offers trained medical interpreters for speakers of several Oaxacan languages (including Triqui, Mixteco, and Zapotec) as well as Spanish. Marilyn Monroe, actress and Twentieth Century Fox starlet, was honored as the Diamond Queen of Salinas on February 20, 1948. Salinas is mentioned in various John Steinbeck novels, and is the setting of his monumental novel East of Eden. In the song Me and Bobby McGee, Salinas is mentioned as where Bobby McGee left the singer - "One day up near Salinas, Lord, I let him slip away". ^ "Community Profile - Visitors". City of Salinas, California. Retrieved January 31, 2015. ^ "City of Salinas - Home". City of Salinas Economic Development. Retrieved December 8, 2014. ^ "City Government". City of Salinas. Retrieved September 22, 2014. ^ "Salinas". Geographic Names Information System. United States Geological Survey. Retrieved November 18, 2014. ^ a b US Census Bureau. "Salinas (city) QuickFacts". State & County QuickFacts. US Census Bureau. Retrieved 26 November 2014. ^ a b c d Durham, David L. (1998). California's Geographic Names: A Gazetteer of Historic and Modern Names of the State. Clovis, Calif.: Word Dancer Press. p. 948. ISBN 1-884995-14-4. ^ a b c d US Census Bureau. "SELECTED HOUSING CHARACTERISTICS". 2008-2012 American Community Survey 5-Year Estimates. US Census Bureau. Retrieved November 4, 2017. ^ Johnson, Jim. 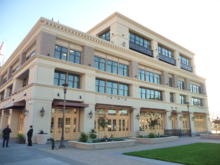 "Monterey County, Salinas discuss alternatives to Capital One complex buy". Monterey Herald: News. Monterey Herald. Retrieved 26 November 2014. ^ The Half Way House and the American Hotel Monterey County Historical Society, by G.S. Breschini, 2000, downloaded Nov. 15, 2016. ^ "History of Salinas". City of Salinas: Visitors. City of Salinas. Retrieved 26 November 2014. ^ Salad days near end in lettuce capital as development boom encroaches. The Baltimore Sun. ^ "hematic Map of Total; Estimate; Speak a language other than English - Spanish or Spanish Creole Geography: by Census Tract". American Fact Finder by U.S. Census Bureau. Retrieved 2016-03-23. ^ a b Seavey, Kent. "A Short History of Salinas, California". Monterey County Historical Society. Monterey County Historical Society. Retrieved 26 November 2014. ^ US Census Bureau. "Census 2000 Summary File 1 (SF 1) 100-Percent Data". Profile of General Demographic Characteristics: 2000. US Census Bureau. Retrieved 26 November 2014. ^ US Census Bureau. "SELECTED SOCIAL CHARACTERISTICS IN THE UNITED STATES". 2008-2012 American Community Survey 5-Year Estimates. US Census Bureau. Retrieved 26 November 2014. ^ US Census Bureau. "ACS DEMOGRAPHIC AND HOUSING ESTIMATES". 2008-2012 American Community Survey 5-Year Estimates. US Census Bureau. Retrieved 26 November 2014. ^ Hill, Laura; Johnson, Hans. "Unauthorized Immigrants in California: Estimates for Counties" (PDF). Public Policy Institute of California. Public Policy Institute of California. ^ DePillis, Lydia. "First Person: Salinas could've been Ferguson. Here's why it wasn't". Washington Post: Storylines. Washington Post. Retrieved 26 November 2014. ^ "Salinas Topography Map". Google. Retrieved 26 November 2014. ^ Epley, Ellen. "Creeks of Salinas: Return of the Natives Work in the Creeks Important for Salinas". CSUMB. California State University, Monterey Bay. Retrieved 26 November 2014. ^ "SALINAS, CALIFORNIA". dri.edu. Retrieved July 16, 2015. 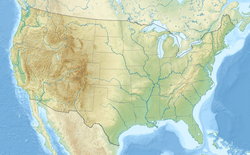 ^ "SALINAS MUNICIPAL AP, CALIFORNIA". dri.edu. Retrieved July 16, 2015. ^ Sophie Bushwick. "The Top 10 Cities for Air Quality". scientificamerican.com. Retrieved July 16, 2015. ^ "NWS San Francisco Bay Area/Monterey". Retrieved May 7, 2016. ^ "General Climate Summary Tables - Salinas, California". Western Regional Climate Center. Retrieved July 13, 2014. ^ "2011-2015 American Community Survey 5-Year Estimates". U.S. Census Bureau. Retrieved November 4, 2017. ^ Kent, Seavey. "A Short History of Salinas, California". Monterey County Historical Society. Monterey County Historical Society. Retrieved 25 November 2014. ^ a b c US Census Bureau, 2008-2012 American Community Survey 5-Year Estimates. "SELECTED ECONOMIC CHARACTERISTICS". American Fact Finder. US Census Bureau. Retrieved 25 November 2014. ^ a b US Census Bureau. "2008-2012 American Community Survey 5-Year Estimates". EDUCATIONAL ATTAINMENT. US Census Bureau. Retrieved 25 November 2014. ^ a b U.S. Census Bureau, American Fact Finder. "Thematic Map of Estimate; Median household income in the past 12 months (in 2014 inflation-adjusted dollars) Geography: by Block Group within Census Tract". American Fact Finder. US Census Bureau. Retrieved 15 March 2016. ^ U.S. Census Bureau. "Financial Characteristics 2010-2014 American Community Survey 5-Year Estimates". U.S. Census Bureau. Retrieved 23 June 2017. ^ a b "US Census Bureau, Income Map". Retrieved 2006-11-02. ^ a b US Census Bureau. "Monterey County 2010 Census Tract Reference Map Index". US Census Bureau. Retrieved 25 November 2014. ^ "2010 Census Interactive Population Search: CA - Salinas city". U.S. Census Bureau. Retrieved July 12, 2014. ^ "California - Race and Hispanic Origin for Selected Cities and Other Places: Earliest Census to 1990". U.S. Census Bureau. ^ "Salinas (city), California". State & County QuickFacts. U.S. Census Bureau. ^ a b Goode, Erica. "In a Gang-Ridden City, New Efforts to Fight Crime While Cutting Costs". New York Times: US section. New York Times. Retrieved 25 November 2014. ^ "Salinas, California, Taco Shop Shooting Leaves 2 Dead, 5 Injured". Huffington Post. Associated Press. Retrieved 25 November 2014. ^ a b US Department of Justice. "Bureau of Justice Statistics". Crime reported by Salinas Police Dept, California. Bureau of Justice Statistics. ^ a b US Department of Justics. "Estimated crime in California". Uniformed Crime Reporting Statistics. US Bureau of Justice Statistics. Retrieved 25 November 2014. ^ US Department of Justice. "Uniformed Crime Reporting Statistics". Estimated crime in United States-Total. US Bureau of Justice Statistics. Retrieved 25 November 2014. ^ Harris, Kamala. "Organized Crime in California: 2010 Report to the Legislature" (PDF). California Attorney General. State of California Department of Justice, Office of the Attorney General. Retrieved 25 November 2014. ^ Robledo, Roberto (12 June 2014). "Agents of change fan out in Alisal". The Salinas Californian. Retrieved 25 November 2014. ^ Arreola, Jose. "Salinas Comprehensive Strategy for Community-wide Violence Reduction 2013-2018" (PDF). City of Salinas. Community Alliance for Safety and Peace. Retrieved 25 November 2014. ^ Guadalupe, Patricia. "Author Spends Ten Years Inside California's Nuestra Familia Gang". NBC News. NBC. Retrieved 25 November 2014. ^ Communications, Forbes Corporate. "Forbes And SVG Partners Will Host "Forbes Reinventing America: The AgTech Summit," July 2015, In Salinas Valley". Forbes. Retrieved 2018-12-27. ^ "Ag-tech investment topped $10 billon in 2017. How much went to women?". New Food Economy. 2018-06-19. Retrieved 2018-12-27. ^ Communications, Forbes Corporate. "Forbes Media Will Host Its Second AgTech Summit, July 13-14, 2016, Salinas Valley". Forbes. Retrieved 2018-12-27. ^ Communications, Forbes Corporate. "Forbes AgTech Summit Returns to Salinas, CA, in June 2018 And Expands with a Summit in Indianapolis in September 2018". Forbes. Retrieved 2018-12-27. ^ "Alliance of Monterey Area Preservationists". www.amap1.org. Retrieved 2017-11-04. ^ "Salinas' El Grito Festival celebrates Mexican heritage this weekend". The Salinas Californian. Retrieved 2017-11-04. ^ "Salinas' El Grito Festival celebrates Mexican heritage this weekend". The Salinas Californian. Retrieved 2017-11-05. ^ "Founders' Day: Salinas celebrates its 149-year journey". Retrieved 2017-11-05. ^ "Music, dance and community fun: Annual Ciclovía Salinas returns Sunday". The Salinas Californian. Retrieved 2018-12-27. ^ Administrator. "About the Festival". www.salinasasianfestival.com. Retrieved 2017-11-05. ^ a b VORA, SHIVANI (2017-04-06). "California's Salinas Valley: Lush fields, good wine, and Steinbeck". The Seattle Times. Retrieved 2017-11-04. ^ Salinas Union High in Salinas, CA. GreatSchools (2010-09-07). Retrieved on 2013-07-19. ^ Salinas City Elementary in Salinas, CA. GreatSchools (2010-09-07). Retrieved on 2013-07-19. ^ "Greyhound Relocates in Salinas, Calif". Greyhound.com. Retrieved 2015-05-19. ^ Shemesh, Denelle (2014-11-14). "Indigenous Interpreting+ bridges language gaps to better serve the farmworker community at Natividad". Monterey County Weekly. Retrieved 2015-04-19. ^ "Bio, Alvarez, Everett Jr". pownetwork.org. Retrieved July 16, 2015. ^ Kiefer, Michael (April 13, 2015). "Jodi Arias sentenced to natural life in prison". The Arizona Republic. Retrieved 2018-06-29 – via USA TODAY. ^ "Salinas native Jodi Arias faces death penalty if convicted". KSBW. March 19, 2013. Retrieved 2018-06-29. ^ "Dustin Lance Black's Moving Acceptance Speech". GLAAD. February 22, 2009. Retrieved 2018-06-28. ^ Mazeika, Vytas (June 20, 2017). "Life comes full circle at Stanford for David Esquer". The Mercury News. Retrieved 2018-06-28. ^ Monroe, Marilyn (February 20, 1948). "Diamond Queen of Salinas". The Salinas Californian. ^ a b c d "Sister Cities - Visitors". City of Salinas, California. Retrieved June 23, 2017. 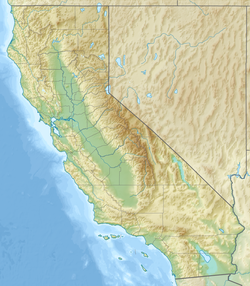 Wikimedia Commons has media related to Salinas, California. 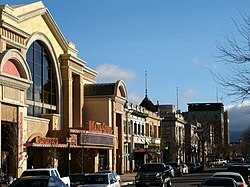 Wikivoyage has a travel guide for Salinas.